Thymus - Apoptosis, Lymphocyte in a female B6C3F1/N mouse from a subchronic study. Tingible-body macrophages create a "starry sky" appearance within the thymic cortex (arrowheads). Thymus - Apoptosis, Lymphocyte in a female B6C3F1/N mouse from a subchronic study (higher magnification of Figure 1). Tingible-body macrophages (arrows) contain intracytoplasmic fragments of apoptotic lymphocytes (apoptotic bodies). 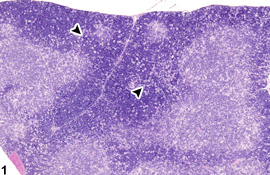 Apoptosis of thymic lymphocytes may occur in rodents as a part of positive and negative selection of lymphocytes (i.e., physiological apoptosis) or secondary to stress-induced adrenocortical hyperactivity, decreased levels of growth hormone, and/or direct toxicity (e.g., corticosteroids, estrogen, or cyclophosphamide). Apoptosis is characterized by shrinkage of individual lymphocytes, condensation of nuclear chromatin (pyknotic nuclei) and cytoplasmic organelles, and fragmentation of apoptotic cells into membrane-bound bodies (apoptotic bodies), which are subsequently phagocytized by macrophages (tingible-body macrophages) ( Figure 2 , arrows). 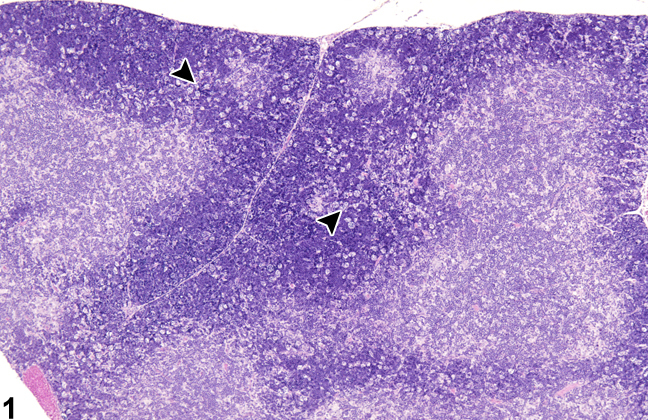 Numerous tingible-body macrophages create a classic "starry sky" appearance in the thymic cortex ( Figure 1 , arrowheads). Significant apoptosis of thymic lymphocytes without cell regeneration leads to atrophy of the thymus. 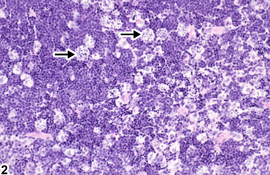 Apoptosis of lymphocytes must be differentiated from lymphocyte necrosis in the thymus, although they can occur together with some chemicals (e.g., dexamethasone). Necrosis of lymphocytes is typically widespread or affects contiguous cells and is not associated with tingible-body macrophages; there is generally pale eosinophilic debris, pyknotic nuclear debris, and inflammation. Massive necrosis of thymic lymphocytes may also be accompanied by inflammation, hemorrhage, and/or mineralization. Early treatment-related lymphocyte apoptosis may be difficult to differentiate from the low background lymphocyte loss that is physiologically normal in young rats and mice. Therefore, comparison with concurrent controls is necessary. Lymphocyte apoptosis in the thymus can be normal. If increased compared with concurrent controls, lymphocyte apoptosis should be diagnosed and graded. Diagnosis should be made based on the judgment of the pathologist. 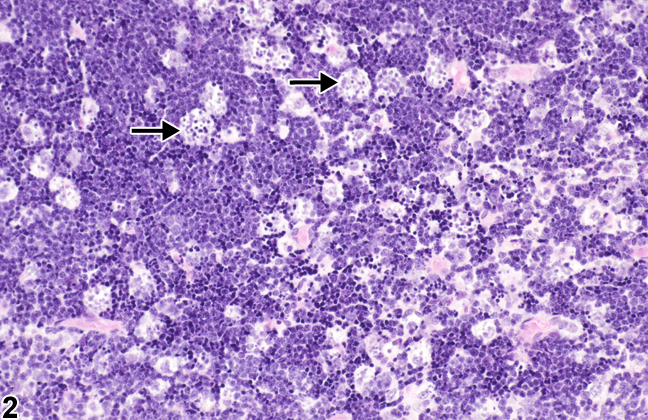 If lymphocyte apoptosis and necrosis occur concurrently, both lesions should be diagnosed. Elmore S. 2007. Apoptosis: A review of programmed cell death. Toxicol Pathol 35:495-516.